Postino Postcards app is a free Windows 8 postcard app available under “photo” category of its App Store. 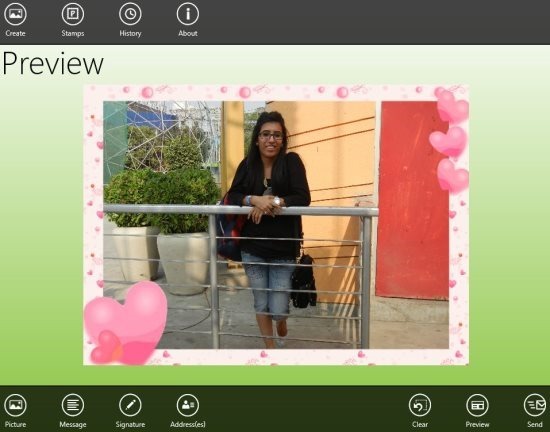 This postcard Windows 8 app lets you create custom postcards and send them to your loved ones with ease, from your Windows 8 PC. The main purpose of this Windows 8 postcard app is to create the personalized postcards of your choice and send the same physically to your loved ones. It means you just have to create a postcard and the app developers will print the same on a high quality paper to send them to the mentioned address. Wow, this postcard app for Windows 8 is truly awesome as it lets you send your message physically to your loved ones with ease. However, if you are not interested in sending the created postcard physically, then let me tell you this Postino app also has an option to send it via email, from your Windows 8 PC. Note: Sending the physical postcard is not free. You need to have physical postcard stamps and those are paid. Also, please allows few minutes for the stamps to be effectively available after purchase. What All You Can Include To Create A Postcard? Picture: The app allows you to insert any picture from your picture gallery or you can click a new photo and insert the same into postcard. Message: Write a text and send the same with the postcard as message to the recipient. Signature: To make your postcard look original, you can easily add your signature in multiple colors. The signature will be inserted at the end the of the backside of the postcard. Frame: Make your pictures look more beautiful with frames. The app has a good collection of photo frames. You can also check our post on Photo Frame App. Email: The app allows you to add up to 4 email addresses and send the postcard to those emails all together. 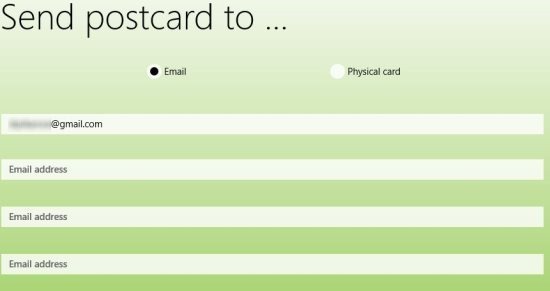 Physical Card: Send the physical postcard to the address of your loved ones. Also, check out our posts on Birthday Frames App, and Smilygram app to add smilies to photos. Send physical postcards to any address. Preview of postcards after completion. Zoom in and zoom out of the image added to postcard. Just open the App Store on your Windows 8 PC and search for “Postino Postcards”. Else, simply open this link in IE10. Now, just click on install button and start downloading the app from App Store. Postino Postcard is truly a nice app to create and send postcards in real-time. Calling and messaging from mobile phones has now become a bit common process between all of us. So, adopt the old style of sending postcard to your loved ones and enjoy.